2017 was a year full of challenges and opportunities for workers. The union movement’s response to the hurdles of the past year are an inspiration to me, and I look forward to seeing how much further we can go in the months and years ahead. Make no mistake: Our movement is under attack. Attacks on unions are nothing new, and we have weathered these storms before. 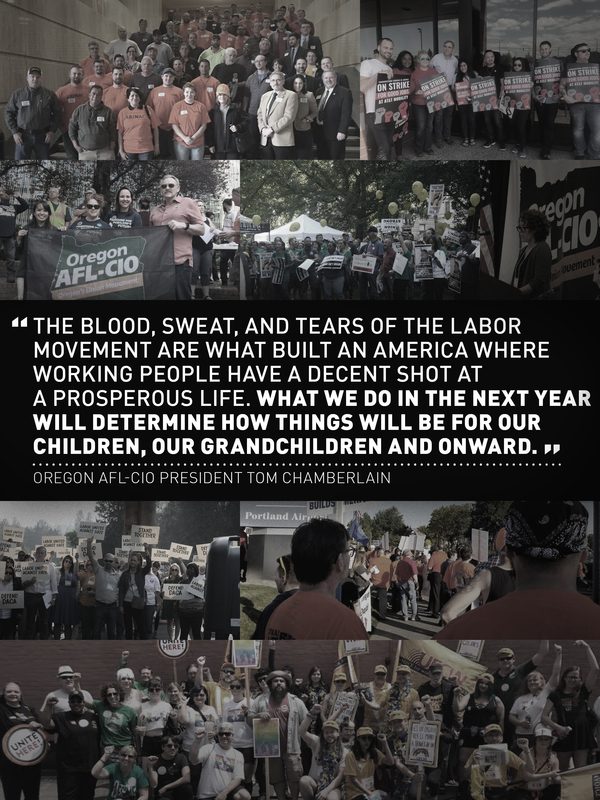 The blood, sweat, and tears of the labor movement are what built an America where working people have a decent shot at a prosperous life. What we do in the next year will determine how things will be for our children, our grandchildren and onward. Our fights are their future, and the lessons of 2017 can teach us a lot about how to move forward. We have seen a strong wave of activism, resistance and organizing that I have personally never experienced, and some of the most inspiring examples are from our own state. The bravery shown by workers standing together to improve their conditions at work is always an exceptional example of what the future may bring. From workers at New Seasons speaking out against union busting, to welders at Precision Castparts rallying for recognition, to medical technicians in Springfield defying a campaign of intimidation to win their election, one thing is clear: Oregon’s workers are thirsty for justice and will not settle for anything less than freedom and fairness. We’ve seen it with Volunteers of America workers fighting for a contract. We saw it during the strike in Lane County. And we have seen it in the faces of everyone who has fought against the travel ban and the revocation of DACA and TPS. There are many more examples of what inspired me from the past year, and they all share a common theme: standing together. The simple idea of solidarity and supporting each other in our struggles is what places the union movement at the center of the fight for a better life for working people. Union members understand the value of standing together and the importance of strength in numbers. That strength in numbers leads to better pay, decent benefits and safe working conditions — not just for unions but for all workers. That’s part of the reason that in 2017 union favorability was the highest it has been in two decades, and union activism is on the rise: The idea of standing together matters more now than ever before. 2017 took us to a crossroads, and we have a choice: Do we keep moving forward by standing together, keep making progress for working people and keep resisting attacks on our rights? Or do we step back and let our opponents try to take us out? I know which direction I am going, and it’s the direction many unions are already headed: forward. The internal and external organizing happening across the state, along with our legislative and electoral wins, are winds at our backs, and I look forward to building strong unions and fighting for working people in 2018.